1. Who will get interstitial cystitis (IC)? IC can develop in any person, irrespective of the age, race and sexuality. The majority of the IC cases have been noticed in women. Men with IC are usually misdiagnosed to have prostate conditions. 2. How is IC diagnosed? The symptoms of IC are similar to those of many other diseases of the bladder. Urinary tract infection, cystitis and prostate-related conditions have the common symptoms of urgency to urinate, pain and frequency to urinate. A routine urine and blood analysis will rule out infectious causes. Other investigations such as cystoscopy will aid in direct inspection of the bladder wall for the presence of any tear or ulcers. There is no evidence of IC being contagious or being sexually transmitted. 4. Is IC a lifetime disease? IC is a lifelong disease. There are phases of the disease when there will be remission and it may recur again and progress. Unfortunately, complete remission of IC can never be achieved. No, IC is not a cancerous condition and it does not prove fatal. 6. What precautions to be taken before taking IC treatment? Comfora is the brand name for pentosan polysulphate sodium. This is the only FDA-approved drug for the treatment of IC. The recommended dosage is 100-mg thrice daily for a minimum period of 3 to 6 months. 8. 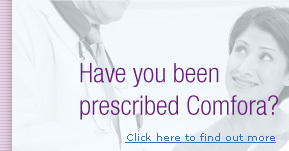 What are the side effects of Comfora? Most common side effects noted have been mild, such as nausea, loose motion and loss of hair. Comfora can induce bleeding in patients with previous history of bleeding disorders, or who is on blood thinner medications such as warfarin and aspirin. 9. Can Comfora cure IC? No, complete cure cannot be achieved. However, it improves the quality of life in a patient with IC by reducing the symptoms of urgency, frequency of urination and the associated pain. 10. What are the alternative approaches for the management of IC? Meijlik JM. Interstitial cystitis, diagnosis and treatment - an overview. International Painful Bladder Foundation. Available at: www.painful-bladder.org.